I remember when this came out, because there was a bit more buzz than usual for new tea books (most of them slip silently into the night, because they’re recipe or gardening books… The only others to kick up some interest were How to Make Tea, and The Art and Craft of Tea, which both came out the year before). It seemed interesting enough to write down on my ‘list’, but just general enough that it went right to the bottom for priority. Not likely something I’d buy myself. But the benefit of newer tea publications, is they’re more likely to get picked up by libraries. This one did, the other two I mentioned didn’t (though I ended up buying How to Make Tea). 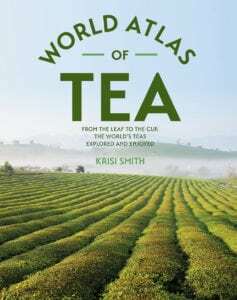 The World Atlas of Tea is another book written by an independent teashop owner; there seems to be a few of those. I wasn’t originally drawn to it, because when I first opened it in the bookshop, it didn’t have as much ‘atlas’ as I was expecting. But it’s no longer a hot item at the library, so I picked it up. The “atlas” is only the second half of the actual book. The first half comprises the first three “parts”: Tea Basics, Tea Brewing and Drinking, and Tea Blending. The second half of the book is Part Four: The World of Tea. My first major gripe. In my mind I’d pictured a book that heavily referenced maps, describing each province/state/region of a country’s role in tea-making, with brief summaries of their individual tea histories and any tea cultural facts unique to them. The book still does cover lots of these, but with a world pre-history in Part One, and the cultural facts mostly just in info-boxes. The first half of the book covers a lot of what you’ll find in most basic tea books. Tea Basics covers plant genetics, varieties, grading, harvesting and processing, all of which I thought it did fairly well, although they skimped on better explaining pu’erh tea, which becomes a problem later. It also briefly covers tea history. I’ve seen better, but I liked the detail it gave (including a bit on auctions), as it doesn’t bill itself as a history book; however, I did have a few problems with the section anyways because the writer did take some leaps in logic that I thought were unnecessary. I might explain more later, but maybe I’m just nitpicking and wishing they’d stick with the facts (or at the very least explain their reasoning). Part One also covers sustainability, which I thought was interesting, and not often covered. But it’s a newer subject, so I don’t expect to see it as often in the older books I read. Part Two: Tea Brewing and Drinking is about what you would expect, and includes a tasting wheel, and a bit about modern steeping and storing, and health benefits (where the book is frank enough, covers the basics, and doesn’t make any wild claims). Part Three covers Blending and also Mixology. I thought the blending portion was actually fairly well-done; it covers what’s often included in flavoured teas (the fillers, the flavouring oils, etc), the purpose of tea blending and more, and gives you a basic blueprint for experimenting on your own. Mixology is short, but basically covers the specialty tea beverages you find in most coffee shops (chai lattes, matcha lattes, iced tea… Would have been nice to see a few more cultural drinks). The first three parts are nice enough, but I find most of it really has no bearing on the actual “atlas” portion of the book. With the exception of the varietals, tea varieties/harvesting, and grading, most of it could have either been scrapped or sorted into the respective countries. Varietals, varieties, and grading appearing at the beginning so that when they’re referenced within the actual atlas, there would be an understanding (such as when the atlas explains that certain countries produce only CTC type teas, or their climate is partial to the var. assamica varietal). My second(?) major problem with the book is that it definitely could have used at least one more read-through by an editor. The spelling mistakes aren’t overly distracting, but there’s just enough of them to be noticeable. There is also awkward grammar, grammar errors, and accidental repetition. Plus a few outright factual mistakes in the atlas section. The main one I remember off the top of my head is “Keemun” as a tea type, appearing for two different provinces (one in Anhui, one… not in Anhui). There was also the odd choice to use both the Keemun and Qimen spellings, one to refer to the tea type and the other for the place. And nowhere (that I recall) does it acknowledge it as the same word with different romanizations, which makes me wonder if they didn’t know. The reason I picked up the book, and the reason this book still shines. There was a lot more it could have been, but I liked the idea, and hope maybe this will inspire more books. The atlas is split up roughly by transcontinental regions, and at the beginning of each, there are quick summaries of all the tea-producing countries in the region. I thought this felt a bit redundant, because it then goes on to include full breakdowns of the same countries. But it does only include the countries that have large enough tea economies to warrant a breakdown (otherwise it’s just relegated to the summary section at the beginning). I don’t know why the setup bugged me, but I feel it could have been better executed. Maybe a list rather than a summary, and then the full breakdowns of the relevant countries, followed by a “Other Tea-Producing Countries” section at the end for summaries of the smaller tea-producers. There are lots of good maps of the regions, with the relevant countries highlighted; the key tea-producing cities and regions are marked in blow-ups of the countries in question, but otherwise the maps aren’t really directly referenced in the work. Still, useful to have. Each country gets a brief writeup on their current standing, history and climate, and then a section on the tea-producing regions, followed by the types of tea grown. 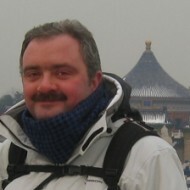 One of the problems with the last two sections is a lack of connection–lots of unique teas are mentioned under regions, and then not given a section under types of teas. Types of teas also doesn’t include the “type” of each tea listed (green, black, etc); so that you have to either hope it’s included in the name (“Milima Black Tea”) or sort of infer from the processing methods if it’s not (Dragonwell, Keemun, Mao Feng…). Overall it doesn’t feel very standardized. Maybe a problem with editing. Another gripe along this same vein is it jumps back and forth between either vaguely stating a region produces “mainly green tea” (in countries where unique tea names are not well-known to the west or used) to instead just listing a number of unique teas (keemun, mao feng, chun mee) with no indicator of tea type. This could have been rectified by saying “green tea (mao feng, chun mee) and black tea (keemun)” or something to the like. My last problem (nitpick?) is their misuse of pu’erh. The book only really introduces pu’erh as all post-fermented tea, past black in processing. That is, it only details shou pu’erh. Which is fine, and not uncommon, as sheng pu’erh isn’t so different from green tea (although it does vaguely reference sheng as being a now-defunct tea type?). Where this sort of becomes a problem is in the atlas, when pu’erh is mentioned in the products of certain regions. In Yunnan, it’s specifically called “pu’erh Yunnan” (is that another fluff? Sounds a bit awkward, versus say “Yunnan pu’erh”); but it’s also listed as a tea produced in the Chan Rai region of Thailand (in Doi Wawee). It would have made much more sense to instead introduce heicha or dark tea as a teatype in the beginning, and instead under ‘types of tea’ in China, put pu’erh down as a specialized Yunnan heicha, or the precursor of heichas, perhaps with a bit of information on sheng and shou production. On that note, the different heichas found in India and other far-eastern countries are omitted. Oddly, there are also a number of Types of Teas that aren’t included in their sections, but instead popped out in the margin/’fun fact’ boxes, which makes finding specific information confusing and annoying (I can understand tisanes, such as artichoke tea, rooibos, and yerba mate being separate, but otherwise). The book does do a pretty good job covering a lot of countries. And it provides information on countries that honestly don’t get a lot of coverage, such as Iran. The story of Prince Mirza in particular was interesting and warrants further reading. But it does forget a couple (and a couple of regions within countries as well). Some of them only really warrant a footnote, such as the US and Australia, and it would probably be easier just to include a list of all the countries it DOES cover (especially since there will be a bunch I miss as well). But, it misses Laos, Korea, Russia, Portugal (Azores), Myanmar/Burma, as well as other, less memorable countries. In India they missed my favourite state–Arunachal Pradesh (it’s not even labeled on the map, sob), but that’s an easy one to overlook. This is a hard one. As far as coffee-table books go, this is a solid one; it’s not walls of text, but the sections still grab your interest enough to browse through, and it’s got a number of scenic photos, although none really caught my interest for very long. The artwork for processing and the flavour wheel were nice inclusions, and it was mostly solidly organized, and included useful statistics (although including year would have been a good touch, as annual statistics will quickly become dated). As far as a reference book though, I would probably pass it. The first half of the book has already been done, and done well, so it’s just a bit redundant. Unfortunately, so much of the book is spent in this section that the actual atlas feels incomplete. If the entire book had been dedicated to the atlas, I feel like it would have been a great reference to keep on-hand. It doesn’t try to be a tasting guide, or describe the characteristics of individual teas, which is good (there are books for that as well). It gives you a solid base for each country, their own interesting backstory and foray into tea production; there are small boxes and between-section dividers with interesting tidbits about tea culture which could have been worked into the regular atlas to make it even more complete. Countries Included: Indian: India, Sri Lanka, Blangladesh, Nepal. Middle East: Turkey, Iran, Georgia. Far East: China, Taiwan (which it breaks out separately but titles ‘Taiwan, China’ without explanation), Vietnam, Indonesia, Japan, Thailand, Malaysia. South America: Argentina, Peru, Ecuador. – why is there always this mandatory part about everything related to tea? – what do we expect from an atlas? I enjoyed this book when I read it last year but noticed a lot of the same issues that you mentioned. I also thought the print was weirdly small.